Slight pause! Has it been two weeks since the last post? Time really got away from us this time. Nate is still with us and still improving, although we had a week or so of "two steps forward, one step back." The first step back was two weekends ago. Friday night (July 11,) Nate decided he felt well enough to lay down and rest. The trouble was, he chose his nap location very poorly. When we looked out the window first thing Saturday morning, there was Nate, laying frighteningly still, next to the barn with his feet pointed toward the wall. Let's just say, some normally unacceptable language spewed forth as we ran for the quiet shape on the ground. As we approached, we could see that Nate was breathing, and that there were no signs of a struggle. The ground around his feet was not churned up, indicating he had not been struggling to get his feet under him in an effort to rise. Just as we got to him, the big goof raised his head and very clearly said "OK, I'm done napping, but need a little help here.............where have you BEEN?" Nate then demonstrated his predicament. His proximity to the barn wall meant he could not position his feet properly to get up. In addition, he was laying on his weaker side. After his "flip," Nate lay sternal and began nibbling on some handy grass. Thinking he would need a few minutes to rest before we asked him to stand, I went to the house to grab the cup of tea I had been sipping earlier and by the time I returned, there was Nate, on his feet, looking like nothing out of the ordinary had occurred. This incredible horse continues to amaze me on a daily basis. That amazement, however, is not necessarily due to his decision-making skills. The very next morning, we got up to find............yes, Nate napping again, this time with his feet pointed at the fence panels. His hind feet were right against the "legs" where two panels hinge together, again meaning he didn't have room to maneuver. Fortunately, since these were portable corral panels, all we needed to do was unhook the joint, move the panels slightly and up he popped. Now for the one step back. Getting down and up temporarily took a toll on Nate's comfort level. Bad timing meant he decided to try something new just as he was being weaned off of the anti-inflammatory medications he'd been on. He went back to leaning on the walls while resting and we had to forgo his evening walks for a few days. Now, Nate seems to be back on track with his muscle and joint rehab, but his feet still present a big problem. The foot that was infested with maggots is very unstable. 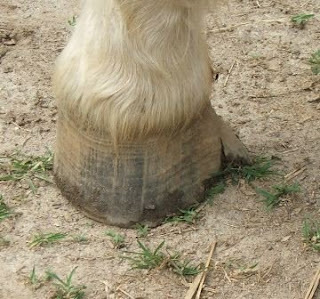 When simply cleaning out his foot, we can see and feel the hoof wall "give" in the heel area where the other structures of the foot are virtually non-existent. 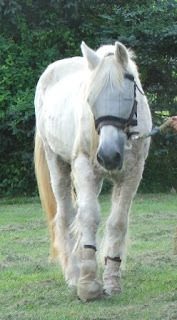 We have both the farrier and vet scheduled to be here at the same time this Thursday to formulate a plan and, hopefully, begin rehabbing all four of Nate's feet, now that he is stronger. Nate's heels are extremely long on all four hooves but, given how long he's been walking in an abnormal fashion, we don't want to make any extreme changes. This hoof rehab will be a gradual process, probably done over many months, allowing Nate's muscles, ligaments and tendons time to adjust to each change. Meanwhile, Nate's enjoying short turnout periods in a small, private paddock. We don't want him to overdo in either the exercise or grazing departments. For the time being, 15 or 20 minutes at a time seems to suit everyone involved, even Nate. We'd like to again thank everyone concerned with Nate's well-being. He seems to thrive on visitors and attention, giving "neck hugs" to all who stop by. Thank you, all: visitors, equine care professionals, complementary therapy practitioners, contributors, and all who email for updates. Neck hugs to everyone. More exciting news today, slightly bigger than a baby step this time. As we exited the convalescent paddock to go on our little walk this morning, Nate cleaning lifted all four feet over the bottom of the gate frame. All four. Cleanly. No bumping, tripping or stumbling. This points to two exciting conclusions: first, that all of Nate's feet and legs are getting the message from his brain saying "There is an obstacle on the ground here. Lift your feet higher than usual and step over it;" and second, Nate's muscles, tendons, joints and all the other parts of his anatomy involved in walking are developing strength. First, let me apologize right up front in case anyone in any way thinks I am comparing my mother's health history to that of a horse. Second, I'd like to thank Mom (Helen W. of Pittsburgh, PA, soon to be "of" Spotsylvania, VA) for reminding us about some aspects of her post-stroke rehabilitation several years ago. Until now, when Nate tired during a walk, we declared him finished for the day and took him back to his paddock. Mom reminded us that, during her rehab, when she tired, the therapists allowed her to stop and rest until she felt ready to continue (her decision,) then did a few more repetitions of the excercise. So, starting now, as we walk with Nate and he tires a little, we'll stop and rest until he seems ready to continue, then walk just a little farther. See? You just never know where horse care ideas will come from! Christmas in July! Today a surprise package arrived from Valley Vet Supply, containing a new manure fork, grooming tools, gauze sponges, a cotton lead and a much welcome gift certificate! Thank you Secret Santa! Nate update: I am in awe of this horse. Or whatever greater power(s?) watches over him. Or both. Or all of them! It seems as though he looks forward to whatever new things come along with each new day. Of course, today we tried something fun. We went for a very very short walk! Now that Nate is showing signs of life in all his limbs, we'll see if building a little muscle tone will help stabilize him even more. Dr. B thinks this might be very helpful. Once he gets a little stronger, she also recommended setting up a little course of 4X4's or other objects to walk over to encourage Nate to pick his feet up higher. Not yet, though. He currently has to step over the frame of the corral panel gate to go in and out. He clears it well with the right foot, but still clips it with the left and the frame bar is only about half the thickness of a 4X4. One day at a time. Later, as we changed his fly boot and flushed his heel, Nate voluntarily picked up his foot! We didn't hold it up very long, but the big news is that he remained stable with his foot held off the ground. He didn't lean, he didn't wobble, he didn't shift his weight. The sole and frog look clean and dry. 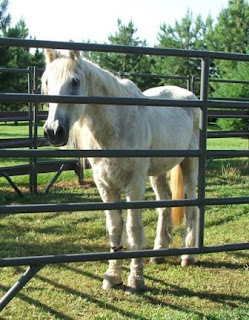 Hopefully, by the time the farrier visits again in a few days, Nate will be able to stand for a very preliminary trim. All we're shooting for this time is to have the dead frog and sole removed and trim off a "wing" of hoof wall that is threatening to break off in an unpleasant way. In addition to not asking him to stand on three legs for a long time, we want to avoid changing his hoof angles drastically all at one time. Finally, one more small milestone. When he arrived, Nate was unable to rest unless he leaned against a wall or door frame. Today, he stood squarely under his fan, head lowered, eyes slammed shut, dozing soundly with no external support. Its amazing how many things we take for granted in our "normal" healthy horses. Standing on three legs when we ask them to. "Sleeping" standing up. Stepping over small obstacles in the field. Swishing flies with a healthy tail. Stomping at a fly on a leg. So many daily behaviors we may not take notice of until the ability to execute those behaviors is compromised. Take some time to stop and watch your horses today. Watch them doing "nothing." Notice how many small maneuvers work together to allow a horse to stand around and do "nothing," and appreciate the perfection of Mother Nature's designs. She knows what she's doing. Nathan is making tiny improvements on several fronts. He is, by no means, out of the woods yet, but at the same time is giving us a tiny bit of hope for the future. As we posted Sunday, we started first with Nathan’s maggot-infested foot. It appears all the nasty little critters have moved on to greener pastures. Back to Nathan and his foot. For the first several days, when we flushed the foot with a strong Epsom Salt solution, the buggers became irritated and began to frantically wiggle around, causing Nathan to stomp his foot. With each stomp, balls of maggots would fall out of crevices and pockets we couldn’t see. It was disgusting and not something I want to see again soon, but some days you just have to hold your breath and do what you gotta do. After three days, no more maggots emerged. The trick now is keep the flies from re-infesting the foot. Wrapping was not working since it was holding too much moisture in the heel. We want to keep out the flies, but not to promote more moisture loving bacteria while doing so. We found one style of fly boot that fits fairly well down over the heel, but not quite all the way to the ground. Adjust the boot. Spray. Pick up all poop crumbs anywhere in the vicinity. Spray. Adjust boot. Another poop crumb. By the time this is over we’ll have become obsessive about the smallest manure crumb in a stall. Now that the maggots are a thing of the past, how do we aggressively treat the underlying infection? The former owner told the Animal Control Officer that Nate had canker. We’re not at all sure, at this stage, that canker is the correct diagnosis. We’re hoping the problem is an advanced case of thrush, which will have a much better prognosis. Another vet evaluation will determine that. Meanwhile, we’re treating it as advanced thrush. The good news about Nate’s feet, other than the departure of the maggots, is that he was able to stand on the infected foot long enough for us to lift and examine the other front foot. Miracle of miracles, it looks pretty normal! 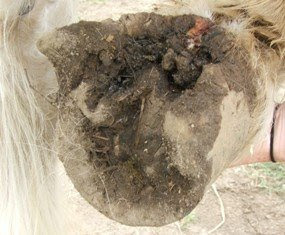 The hoof is overgrown and badly in need of trimming, but the frog and sole look healthy. The second portion of this update concerns Nathan’s balance problems. The vet did not think the source of the trouble was a virus or protozoal infection, but more likely trauma to the spinal cord. That could be good. That could be bad. If the damage was recent, and we can reduce the inflammation, Nate’s neurological symptoms might diminish significantly. If the damage to the spinal cord is long standing, the chances of repair are much lower. Not knowing the history of this specific issue, we began with a hefty hit of anti-inflammatory medications. Three different drugs were administered the first day, continuing one of them daily until the next vet exam. Starting Monday, June 29, we invited quite a few Reiki practitioners to join Nate’s caregiver team. Seven practitioners have been offering Reiki treatments for the past week. Today, a bodywork specialist worked with Nate as well, integrating several techniques into one treatment. Now…….whether you believe only in Western medicine, or only in “alternative” modalities, it’s undeniable that in some cases, the combination of pharmaceuticals and complementary therapies produces results that can’t be explained. Today, we’re thinking there will be much more to the story. This afternoon, I watched Nate pick up the leg we thought was significantly paralyzed to stomp at a fly. Not once, but three times. And remember the lifeless tail? A week ago, it hung limply with no movement at all. Several days ago, Nate began to lift it slightly. We first noticed this when he lifted it and held it up while having his temperature taken. He could lift straight up, but there was no movement from side to side. Today, however……….Today, Nate not only lifted his tail, but moved it noticeably to the right. To his stronger side. If we see that tail move to the left, you may hear us shouting from somewhere out in Idaho. The “listing” is also almost gone. Nate now stands more squarely on this hind end, although he does rest the left leg quite often. One more tiny milestone for today was a very (maybe only 20 seconds) short episode of bearing his weight entirely on the left hind to rest the right for just a moment. Baby steps? You bet. Reasons to keep trying a while longer? You bet! Hope is a powerful thing. Its official! Our favorite vet clinic recently welcomed a new associate, Dr Heather Trout. Dr. Trout has been to Traveller's Rest several times since joining Rappahannock Equine Veterinary Clinic. The Geezers love 'er and I'm sure plan to teach her a few new things about "old" horses. All we can say is "Watch out, Dr. Heather. They may be old, but they have wicked wicked senses of humor!" Read more about Dr Trout in the Culpeper Star-Exponent. We apologize for the delay in “Nathan Updates.” Nathan has only been here one week, but it seems like we have volumes to write about him already. We’ll have to post about him over several days. As the trailer door swung open, the most obvious problem was his weight. Even with an abnormally thick summer coat, hip bones, ribs, shoulder blades and vertebrae were clearly defined. The heavy coat itself seemed a big bold arrow pointing clearly to Cushings. Nathan’s feet were all abnormally shaped, obviously not trimmed in some time. The biggest concern, however, was his balance. The gray gelding’s back end did not seem to be doing quite what he asked it too. He “listed” to the right, dragging his left hind leg any time he turned in either direction. There was no life in his tail, which hangs limply while the other horses’ tails swish gracefully back and forth as they graze. Any one of those conditions, other than neglected feet perhaps, put Nathan’s future in question. Together, they seemed impossible to manage. The Animal Control Officer who brought Nate to Traveller’s Rest considered this a need for urgent veterinary care. We agreed and made the call. While here, the vet also documented Nate’s condition at time of arrival. During the veterinary exam, the two biggest concerns were Nathan’s feet and his balance. Working together, the two issues made each difficult to evaluate separately. With poor balance, Nate couldn’t pick up a foot easily. Abnormal feet aggravated the balance problem. 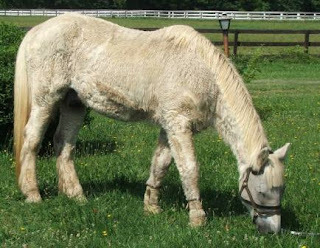 This combination of problems also made it hard to determine just how much of his lameness was pain and how much was neurological impairment. In addition, Nate had no muscle mass due to his malnutrition. 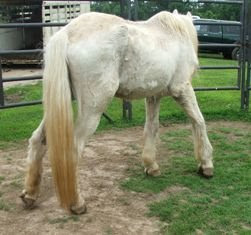 Starve horses often drag their feet until they become stronger and rebuild muscle. The maggot infested foot was addressed first. 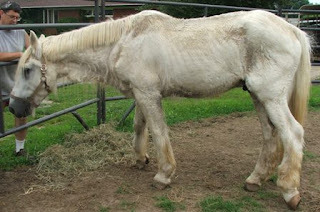 It was cleaned, flushed and poulticed with a Betadine/Epsom Salt paste, held in place with a baby diaper and duct tape. Not pretty, but functional. The hope was that the salt would kill any maggots that might still be hiding in any crevices, or hadn’t yet emerged from the diseased tissue covering the bottom of Nate’s foot. To thoroughly debride the foot, Nate will likely need to go to the vet clinic, but that’s a decision for later. At the moment he is likely not strong enough to tolerate anesthesia. Where do we start in formulating a possible rehabilitation plan? 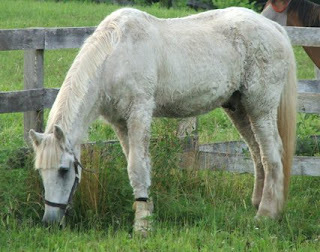 Can we rehabilitate this beautiful old soul? Being realistic, as we continue to evaluate, it may be determined that the kindest thing we can offer our big new horse is a peaceful transition to his next life. That remains to be seen, but we’re trying to keep an open mind.